Practices are held in the evening two times a week from 6:30-8:30 pm. This works out to over 100 hours of football - making Fall Predators one of the best values in minor competitive sports! The Predators Fall Competitive Divisions are separated into two levels Rep & Minor Development which provides an opportunity for all players to have success on the field! The Minor Development Tier focuses on participation and incorporating fair playing time as a fundamental element. The Rep Tier incorporates more competitive elements for players assessed to have greater skills. A selection process is undertaken for all players based on their abilities and their interest in playing for the Rep team. Those that are not selected for the Rep Team, are then placed into the MD division. Our teams play in the Ontario Football League (OFL) . 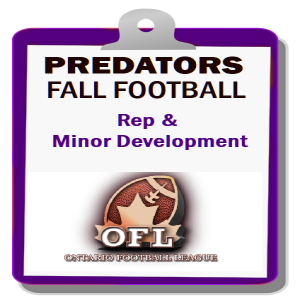 Visit the OFL website for a complete understanding of other centres in these leagues, team game schedules, game score updates, rules for the various divisions and other important information. We make football fun and affordable. We offer the option for split payment using credit card. Debit can also be used when paying online but not for split payments. All of our payment options are available at our online registration portal. Registration for Atom,Peewee,Bantam includes a high quality game jersey with the player’s selected number which is non-refundable once the jersey order has been placed with the supplier. For complete refund details, visit our Refund Policy page.